From 13 - 19 June 2016, get a free a la carte Super Red Burger with every purchase of a Super Red Extra Value Meal™ at McDonald's main stores. McDonald's McCafe is celebrating Coffee with 1-for-1 Frappe from 29 April to 5 May 2016! From 22 Feb onward, get the McDonald's Limited Edition Collector’s Kit including: Fries, Cold Cup, Apple Pie, McFlurry®, Big Mac®, and a Restaurant Model, which is exclusively available in the Collector’s Kit. 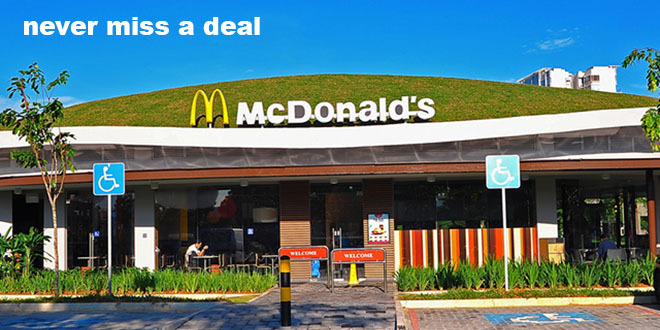 McDonald’s has just released a series of coupons to help you save on dining at their restaurants from 11 to 20 Dec 2015! Flash the coupons provided in the article to enjoy the discount! On 13 Nov, McDonald’s® will be giving away 100 Create Your Taste burgers (worth up to $8.95) for FREE. McDonald's will also be giving away FREE Brownie Bites & Personalised Coke Can on selected dates and stores! From 9 Oct to 14 Oct 2015, simply flash the coupon image below to enjoy McDonald's Cereal Ebi Burger at only $2 with purchase of any Extra Value Meal (EVM). Enjoy McDonalds' selected Chill beverages at 50 cents off! Simply head down to their stores and ask for your Chill coupon now!